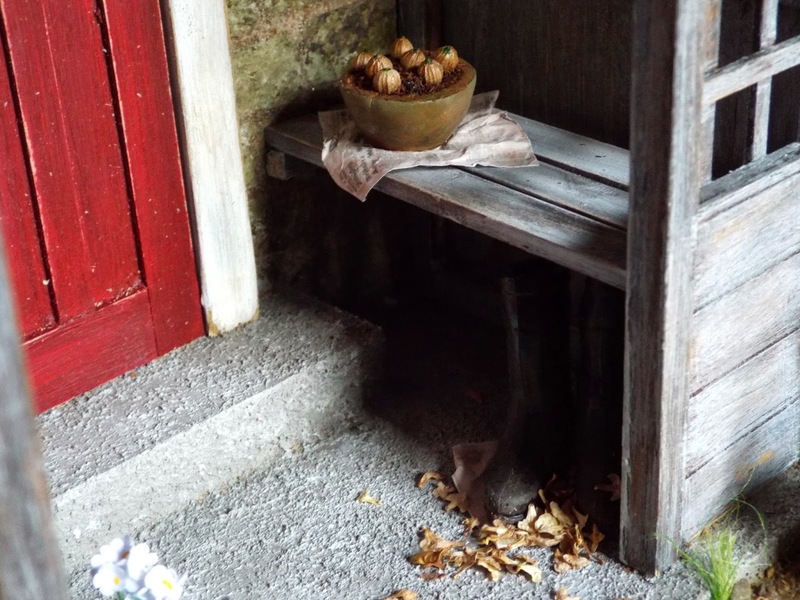 Fabulous Saturday, 1930s Porch & The Week Ahead! 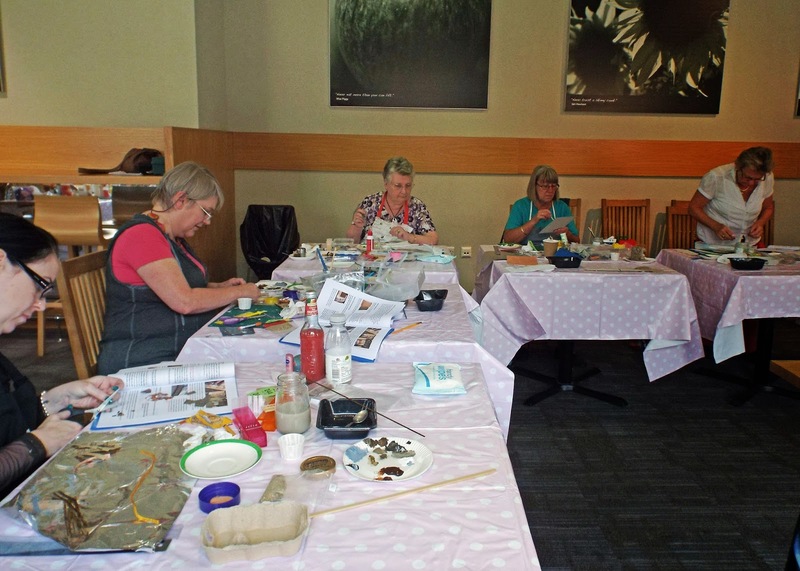 Many thanks to all the lovely ladies who came to our "Down The Little Old Herb Garden Path Workshop" on Saturday. Everyone worked so hard. Passers by in the restaurant (including staff) who could see us all through the glass wall were fascinated and intrigued....so much so that one or two even ventured in to enquire on what we were all doing....haha! A "BEFORE" PHOTO, DURING SETTING UP - IF YOU LOOK CAREFULLY YOU MAY JUST SPOT ROBIN LOOKING BUSY! THE ROOM IS ENORMOUS AND SO LIGHT & AIRY! A "DURING" PHOTO, SOME OF THE LADIES HARD AT WORK! WE BROUGHT ALONG VARIOUS EXAMPLES OF PAST WORKSHOP PROJECTS TO GIVE THOSE ATTENDING FOR THE FIRST TIME, AN IDEA OF WHAT WE DO! 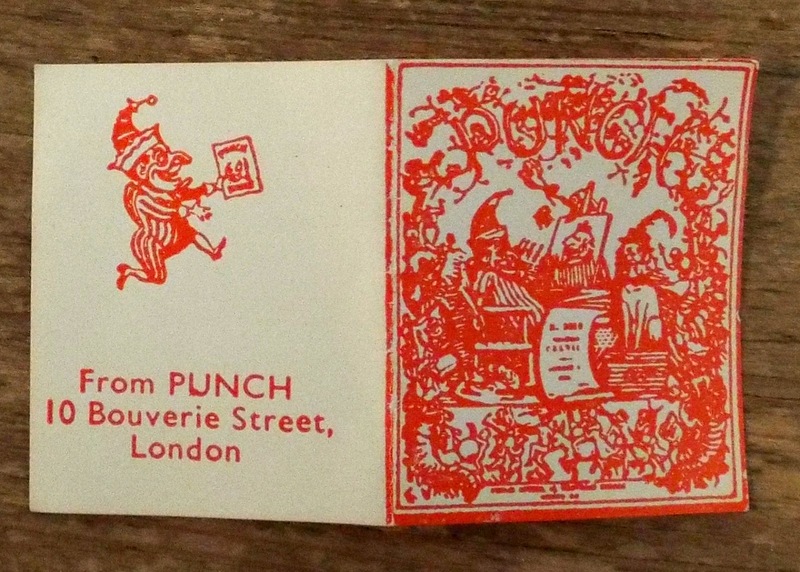 On Wednesday, my workshop colleague Robin and I will be trekking into London to visit the Museum Of Childhood for research purposes, regarding our next workshop project. For those of you who are antique and vintage enthusiasts, you may enjoy the paint techniques that are to be used on our next workshop project. 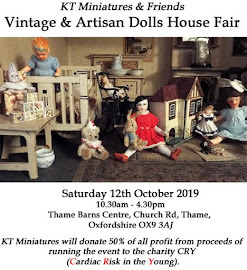 More info will follow shortly both on our Nostalgia In Miniature Workshop Website - CLICK HERE or here on KT Miniatures Journal too. So watch this space....as the saying goes!! We were thrilled to receive a copy of the latest Dolls House & Miniature Scene "Projects 2015" annual magazine which has now been published and released for general sale. It features our 1930s Porch as a "how to make" feature, which is set in autumn and based on actual real life sized plans from an old porch. The project is incredibly versatile and certain elements could be used in a variety of ways. 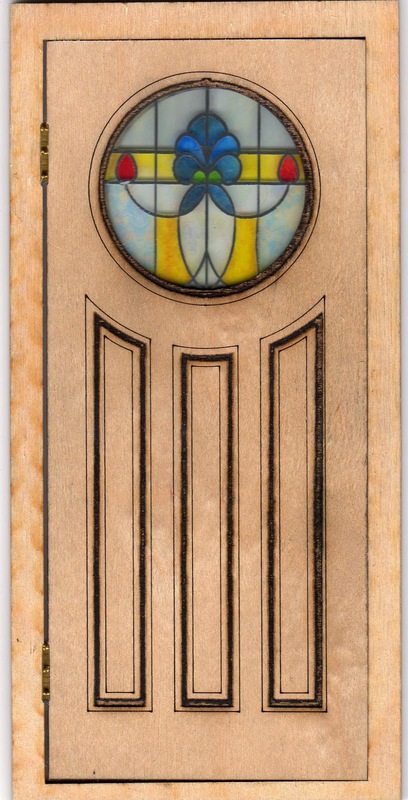 For example, the front door is based on a real life sized 1920s/30s door, including an imitation "sunrise" window panel. 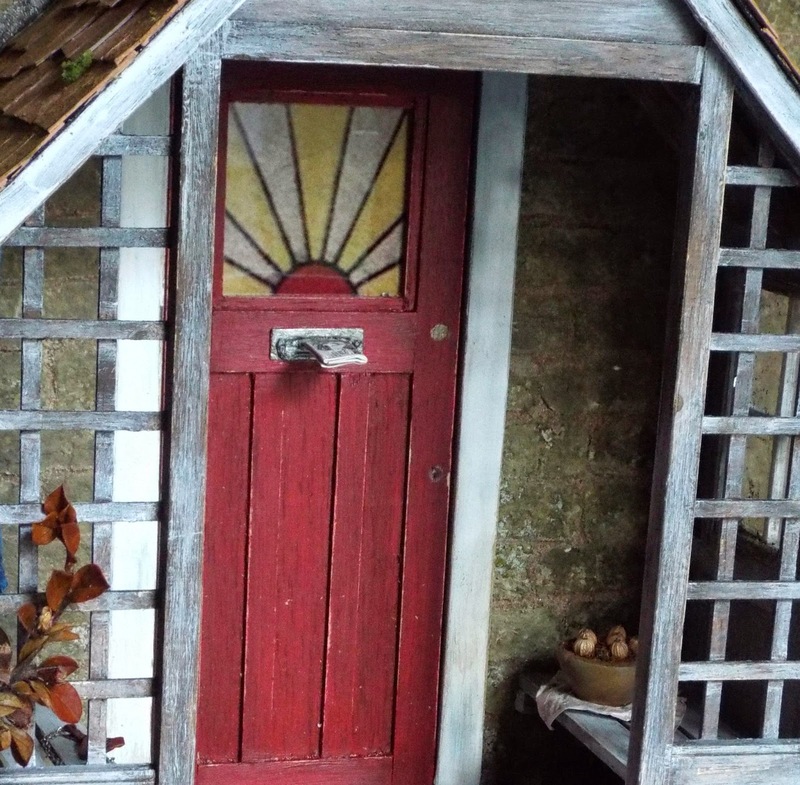 The letter box is simply made from tin foil, cereal packet, glue and paint...yes, honestly! For a quirky touch, we fixed an old miniature newspaper in the letter box! 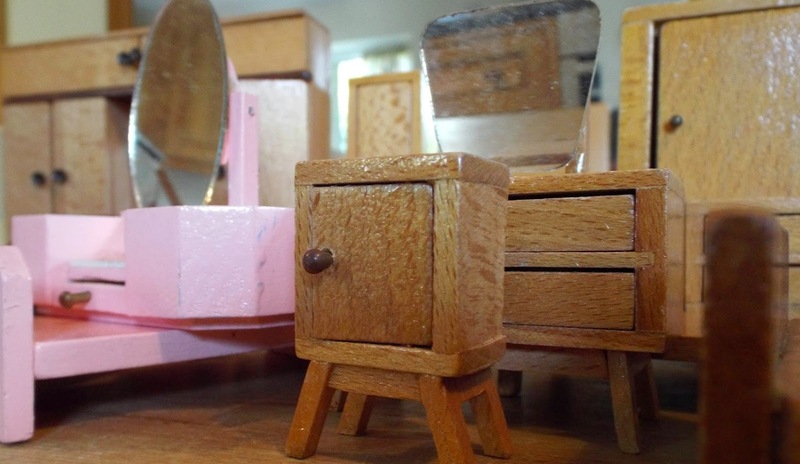 This could be used in not only a modern reproduction dolls house but a vintage dolls house too, maybe? 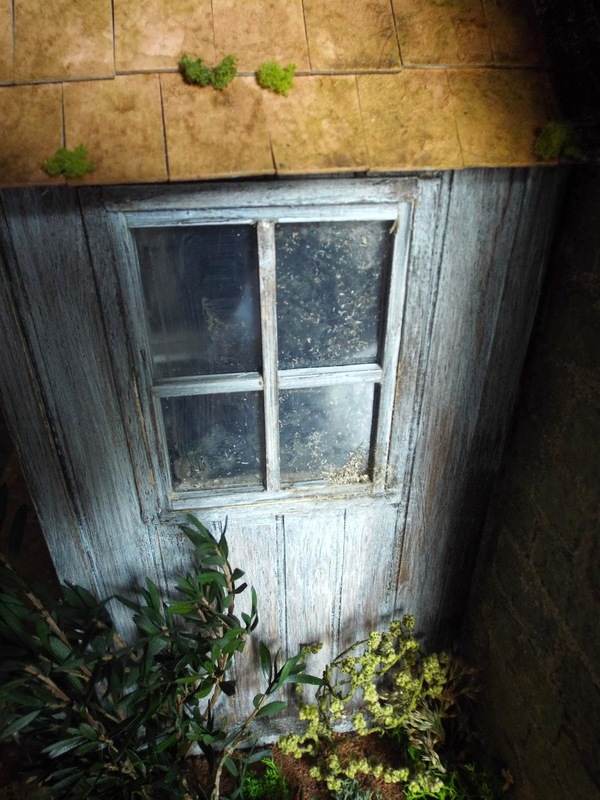 The aged wooden side panels, including one with an old window, could be adapted and used as part structure of an old shed or outhouse perhaps? The stone wall and tiled roof could be used in an array of other projects. 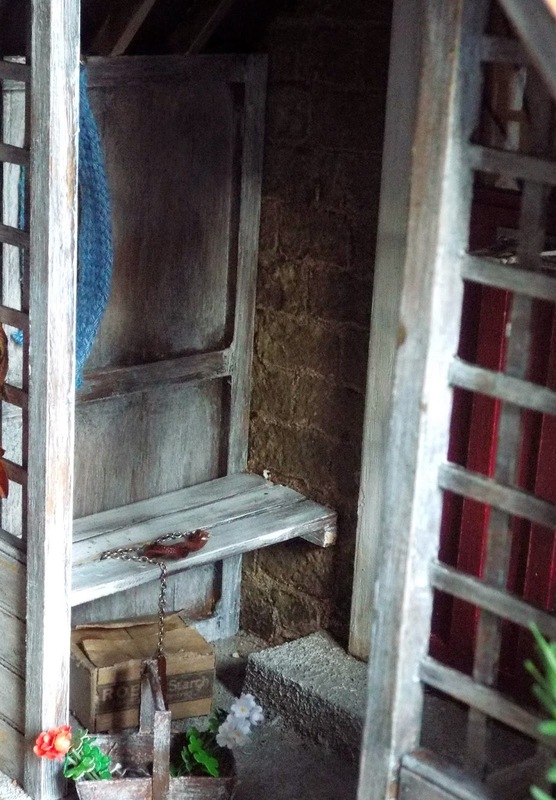 The porch structure with built in benches could even be adapted and used as a garden shelter? Looking Forward To Saturday's Workshop...Plus A Buyers Beware Warning! All is now ready for our impending workshop on Saturday. Both Robin and I are very much looking forward to seeing those of you who have booked a place....it should be a brilliant day. If you have mislaid your details of directions, information for the day,etc. 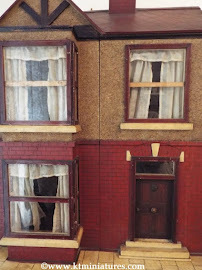 they have been repeated on our Nostalgia In Miniature Workshops Blog. 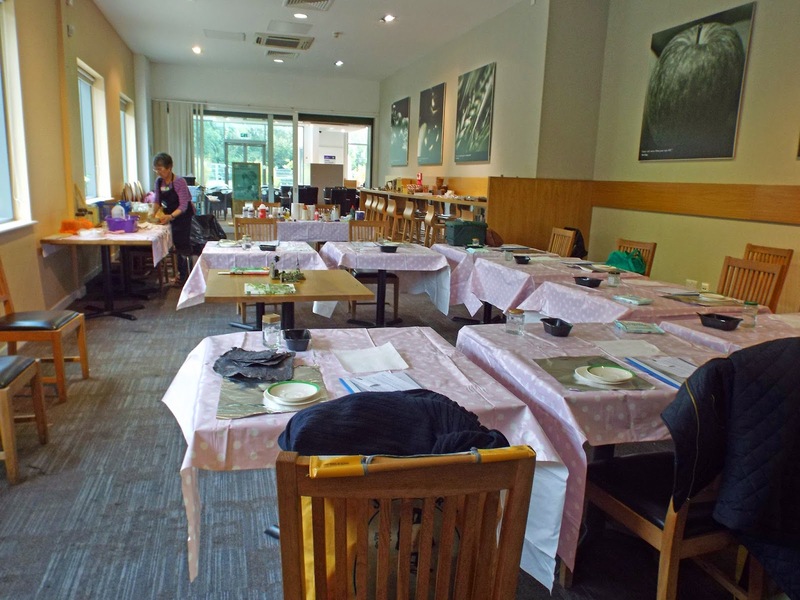 Already though....plans are afoot for our next workshop, which we are aiming to hold on a Saturday in June 2015 at our lovely Bicester venue. We hope to bring you news very shortly of a very exciting and probably the most ambitions constructional project to date....and without giving too much away, let's just say that for all those of you out there who are lovers of antique and vintage miniatures....this may well appeal to you too, as well as those of you who simply like a creative challenge. We are not able to book a 2015 date at the Bicester venue until the beginning of January, so booking will not officially open until then but we have started a Reserve List for anyone who is interested in coming. By adding your name to this list, is by no means a firm commitment on your part, but more like an expression of interest, and you will be sent details and offered a place before booking opens officially midway through January. AND NOW....A BUYERS BEWARE WARNING! 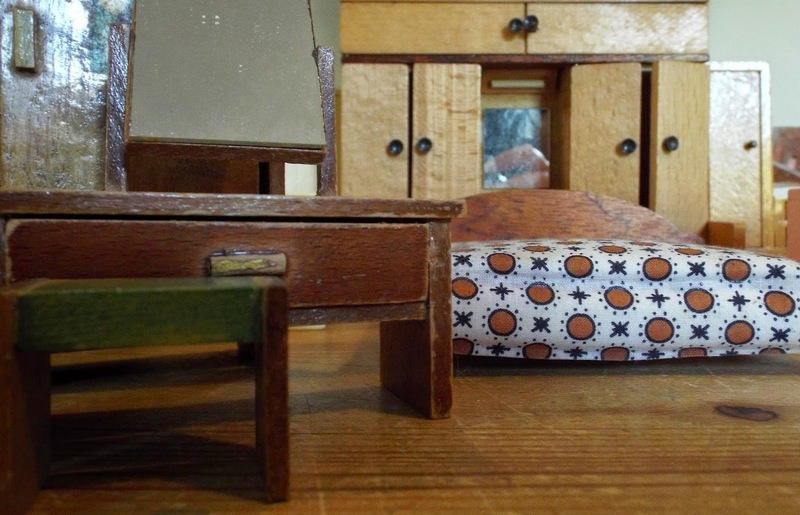 Very recently by chance I discovered on an online dolls house forum, an item up for sale described as a "WW2 Chair by KT Miniatures" and was being offered "at half price for £25.00". The chair had definitely not been made or sold by me but in fact the item was a very obvious sad attempt to plagiarise my style of work! To have my company name so very publicly associated with such a poorly made item was embarrassing, disconcerting and potentially damaging to KT Miniatures. A couple of emails to the seller then ensued, an immediate private apology followed, and KT Miniatures name removed from the advert. She then told me that she bought it off a local person as a job lot and was only going on what she was told by that seller. 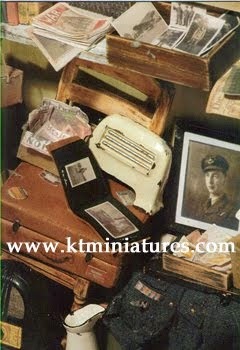 KT Miniatures has NEVER made a "WW2 Chair" consisting of a a mixture of homemade WW2 printed items and commercially produced WW2 items stuck down to a readily available imported chair plus what we think was meant to be a flying jacket draped over the back with huge chunks of out of scale fur glued to sleeve and collar. 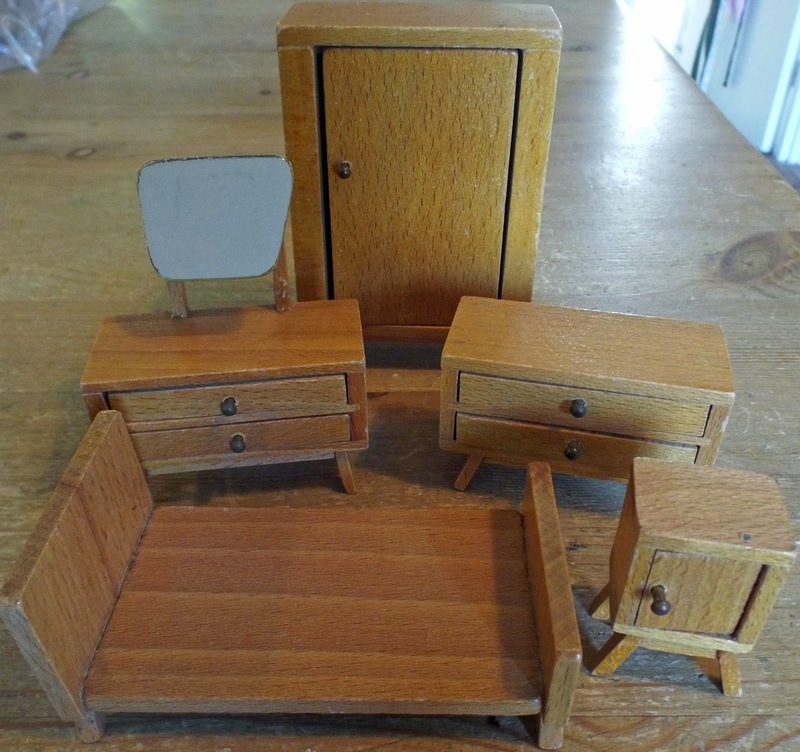 Just a quick posting to say that more multiple listing of vintage Dol-Toi pieces from Marion Osborne's Collection can now be found on KT Miniatures' Dol-Toi Page.....including various bedroom sets. 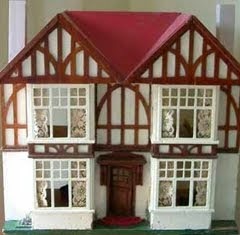 Suitable for vintage 1/16th scale dolls houses. 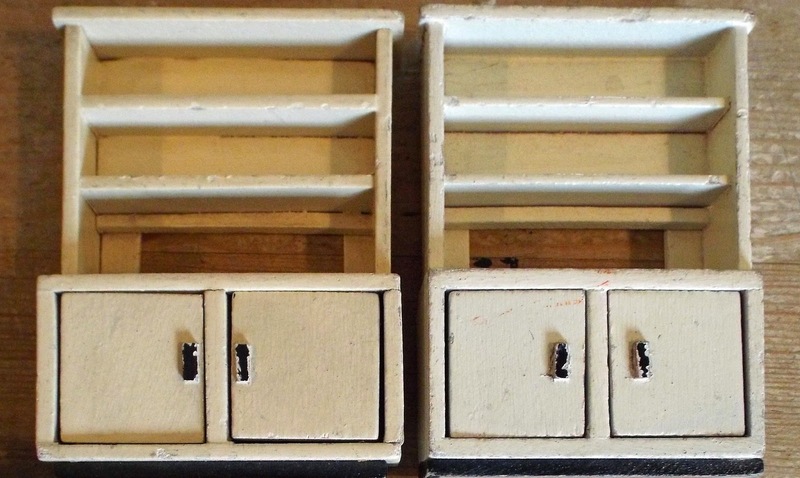 Are You In Need Of Art Nouveau Or 1920s/30s Style Windows & Doors For Your Dolls House? 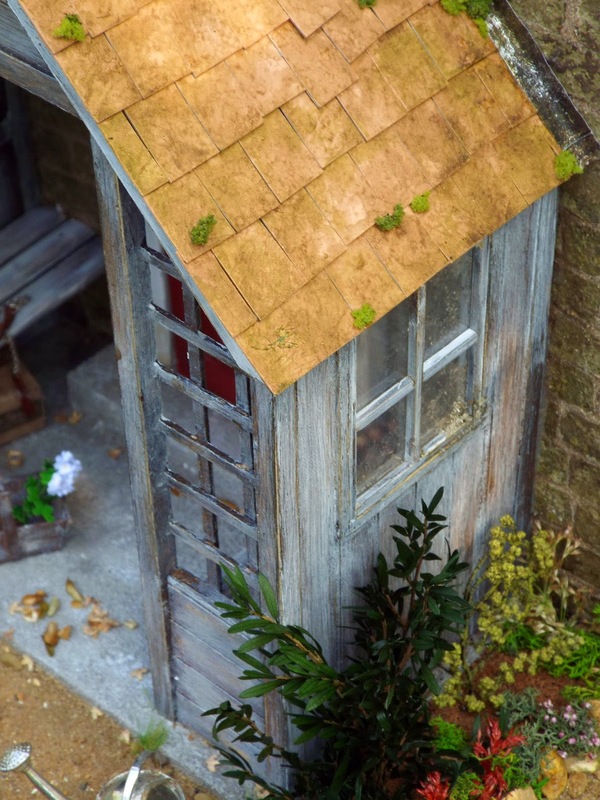 Oxfordshire based Malcolm Smith of Malcolm's Miniatures has been making Art Nouveau & 1920s/30s style doors and windows in 1/24th scale for quite some time now, and I told him to get in touch with me when he begins making the larger 1/12th scale, as I felt they could be useful to many readers of KT Miniatures Journal who not only have modern reproduction style dolls houses...but maybe for those of you who have vintage dolls houses from that era too. Well here we go....Malcolm has got in touch! 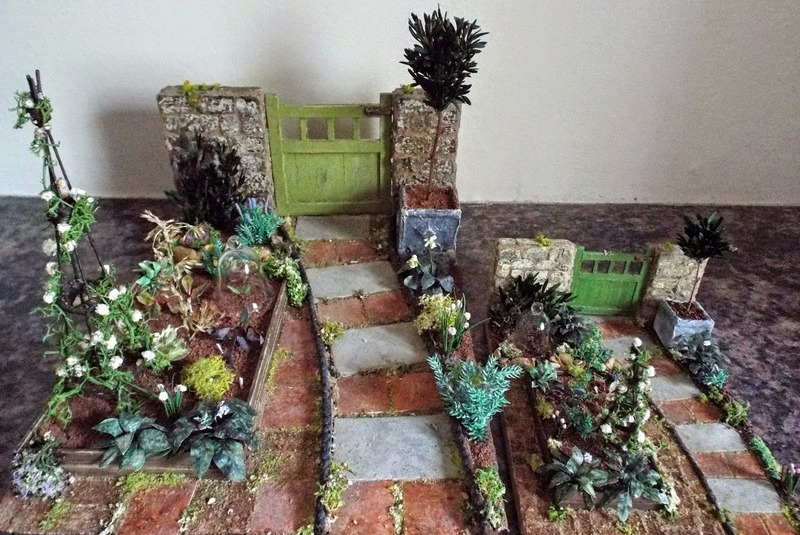 A Little Autumn Scene For Projects Magazine- See At Miniatura! 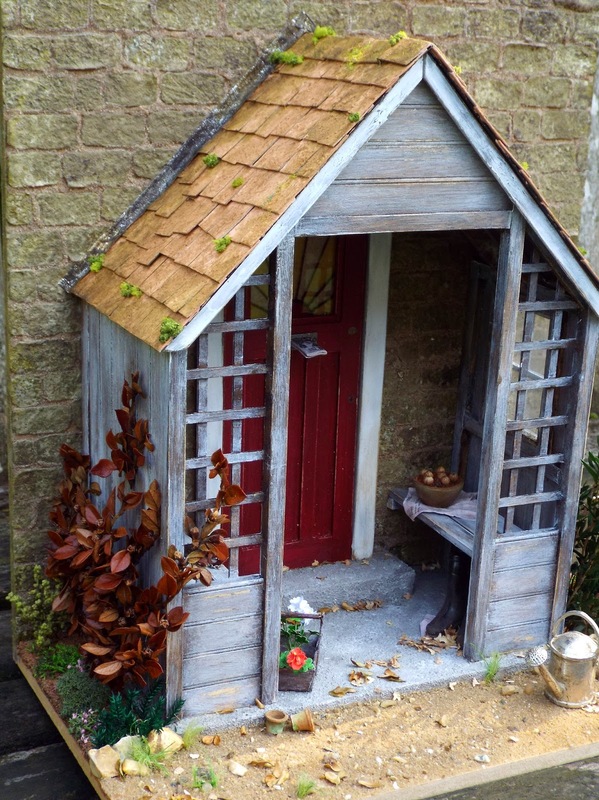 If you take a look at the brand new Dolls House & Miniature Scene "Projects 2015" magazine that is coming out very shortly, you will find another joint "how to make" feature by Robin Britton, my Nostalgia In Miniature Workshops colleague, and myself.......we absolutely loved making this! Have you guessed what the little scene is yet? If you look closely there are many seasonal hints. 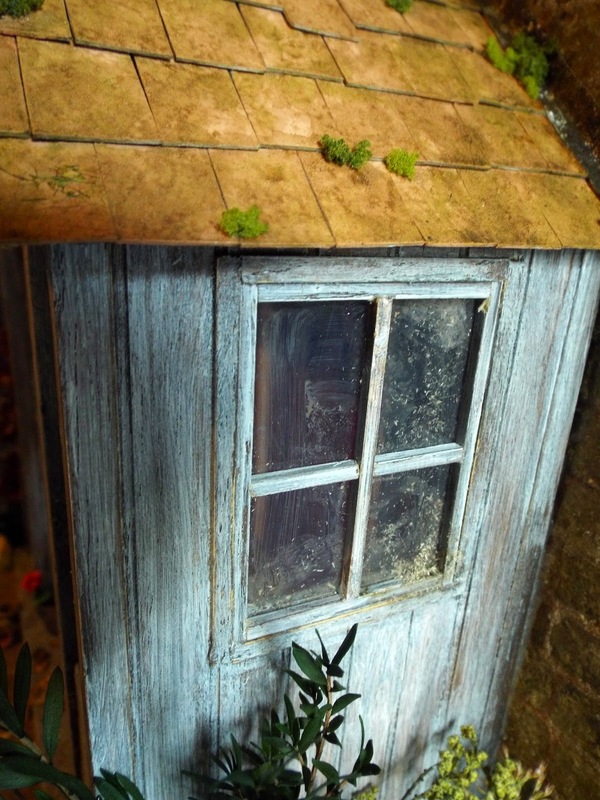 but adapted slightly, in our usual Nostalgia In Miniature Workshop style! Sorry folks, that is all I can show you for now but hope it has got your creative tastebuds going to find out more! 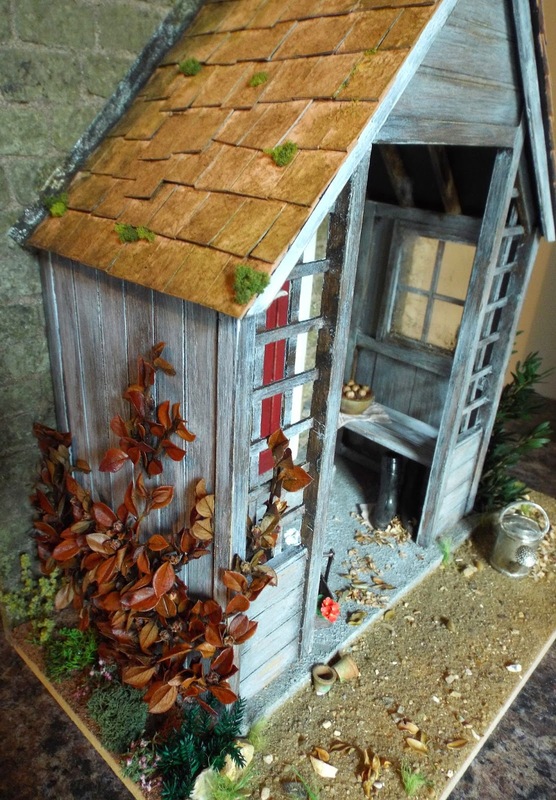 If you are visiting the Autumn Miniatura Fair at the NEC next weekend, you will be able to see this in all its glory, along with our WW1 Scene that has been featured in the magazine over the past 3 months....all on the Dolls House & Miniature Scene stand. 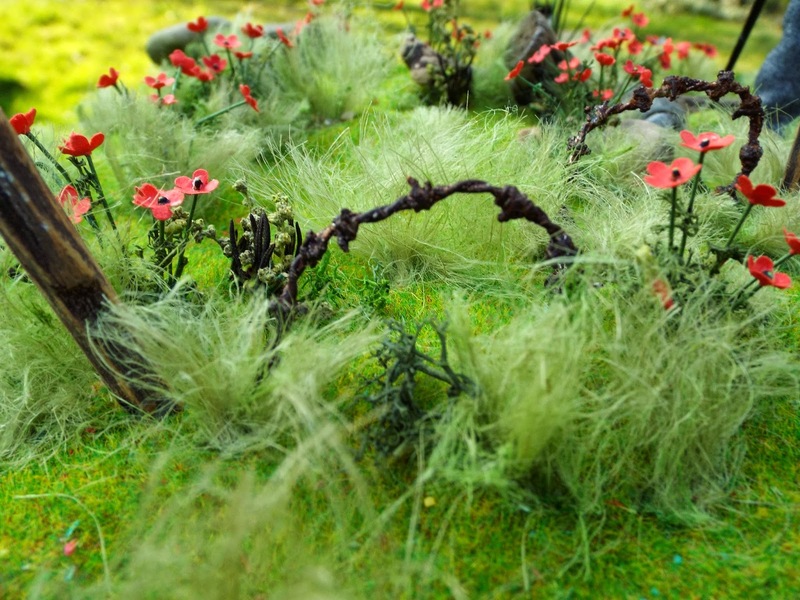 Don't forget, the WW1 Scene will be available to purchase for offers in the region of £250......and 50% will be donated to the Royal British Legion. Plus we understand the "Projects" magazine will be hot off the press and available to purchase at Miniatura. Sadly neither Robin or I will be able to get to Miniatura next weekend, but do go along and say "Hi" to Lucie Roper (editor) and her team. They will be exhibiting some of the fabulous entries to their wonderful WW1 Competition too....so a lot to feast your eyes on. I have been away up north for a couple of days folks, so my apologies if you have been trying to get hold of me by email or phone! Am now in the process of catching up on the backlog of emails. However, if a lady in Australia called Leila is reading this...sorry but my emails to you are bouncing back with the message "domain has no valid mail exchangers". I have no idea what that means as I have not come across that before but the only immediate solution that I can think of is if you could please contact me via a different email address? "This August our village - New Quay in Cardiganshire, staged an exhibition to commemorate those who served and died during the First World War. 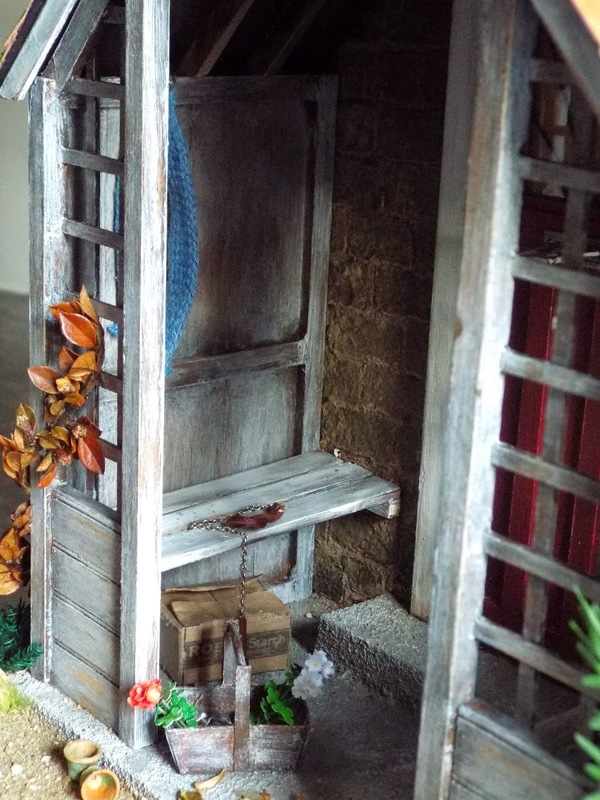 In a KT Miniatures newsletter I had seen advance notice of the dugout designed by Celia and Robin, in Dolls House & Miniature Scene magazine, and simply had to make it for the exhibition. The instructions were very easy to follow, I had to adapt it a little as we were planning for ours to be a dugout during the war, rather than revisited later. 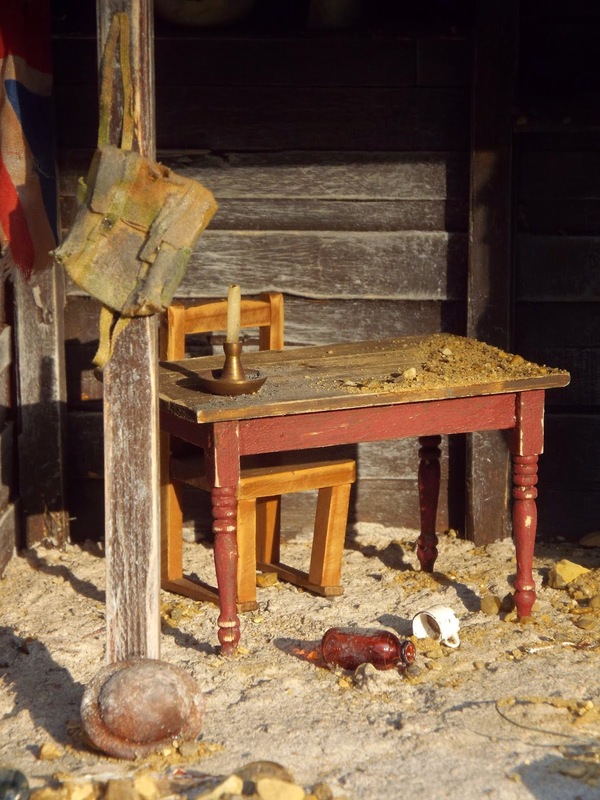 How accurate Celia and Robin's dugout proved to be, as was demonstrated by the discovery among the artefacts lent to us of a postcard showing King George V outside an identical dugout! So we displayed the two together. Everyone found the exhibition deeply moving. We are a small community, and the relatives and descendants of all the people named were known to us. My father and four of his 5 brothers served in the war and so we were able to include more than just photographs with items like his diary, and there were personal stories from many others too. 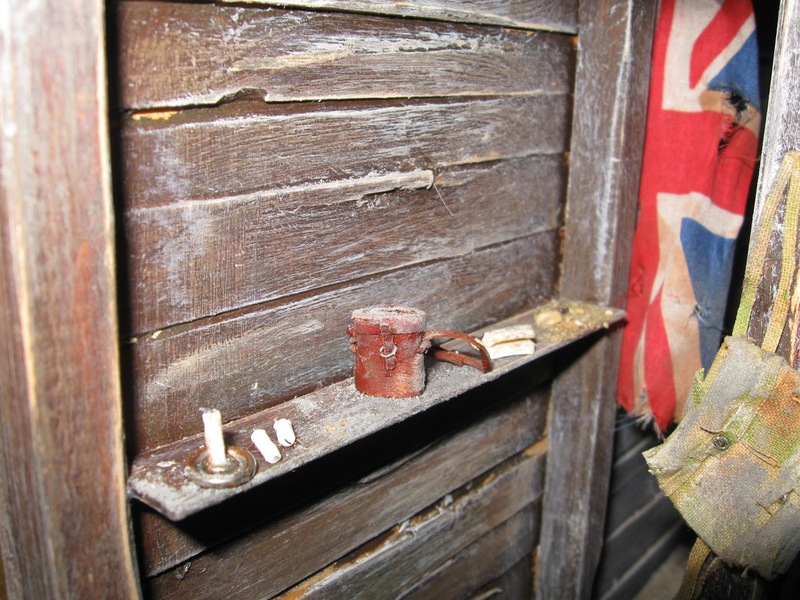 Touches like the dugout helped the children to understand and in the prisoner of war section, we also had some real live lettuce as the prisoners struggled to grow their own food in biscuit tins for want of decent ground, which also impressed. Our visitors' book was full of appreciative comments from strangers as well. And several children said to me that they wanted to have a go at making their own dugout, so I told them where to find it." A big thank you to Sue for taking the time to send me this photo and story, and for letting me show it on here. 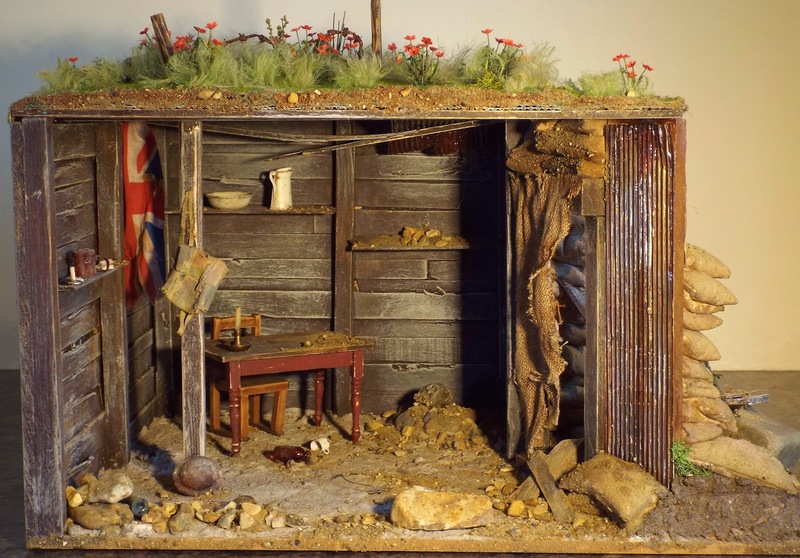 If anyone else out there has been inspired by our WW1 project and gone on to make the dugout, do please get in touch....both Robin and I would love to hear from you. 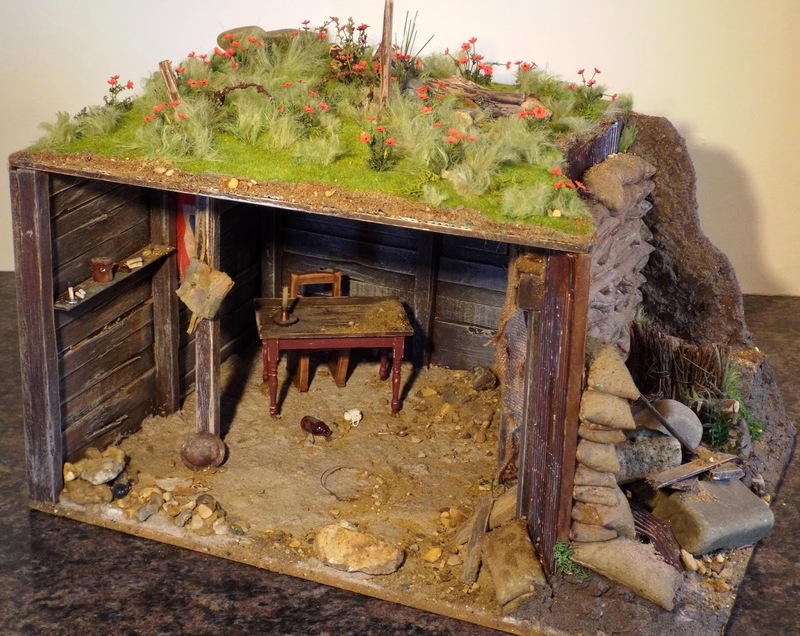 Our Little WW1 Dugout, Trench & Poppy Field...Can Be Seen At Miniatura & Is Now Up For Sale! 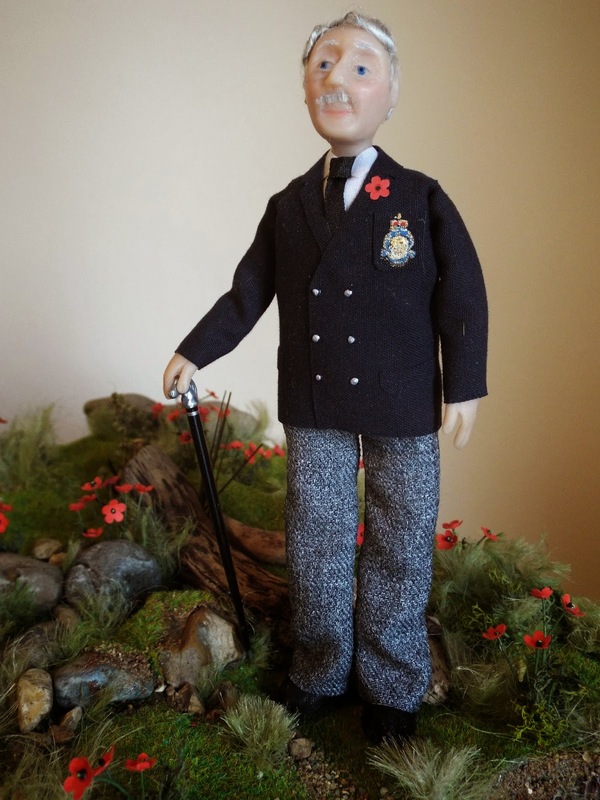 Robin (my workshop colleague and co-creator of this project) and I are delighted to announce that it is now up for sale, to help raise funds for the Royal British Legion (50% of all proceeds will be donated to the charity). 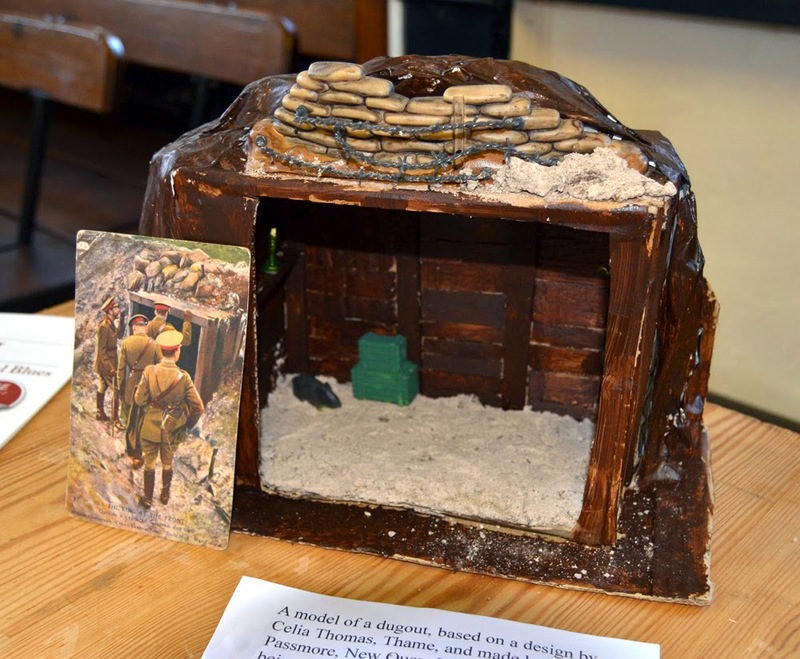 For the past 4 months, this has been on display at Thame Museum (Oxfordshire - UK) as part of the museum's WW1 Centenary Exhibition...where it has been a big hit with visitors, we understand. We will accept offers in the region of £250.00...however please note, due to the sheer weight and fragility of this completed project, it will have to be collected in person. If you wish to purchase it at Miniatura, it will have to remain on the magazine's stand until the end of trading on the Sunday. Hope someone out there can give this a good home.